Master Sergeant (retired) Ron Spradling is a decorated, 20 year, Air Force veteran. He has an airframe maintenance background that includes working on the F-16 Falcon, A-10 Warthog, and numerous other aircraft. He has taught over 2000 hours at the Aircraft Structural Maintenance Technical School at NAS Pensacola, Florida, and he also has served overseas in Saudi Arabia, South Korea, and Afghanistan. He received his BS Degree from the University of Management and Technology and now runs a restaurant delivery service (CitySpree of Pensacola) with his wife, Patty. CitySpree of Pensacola has been recognized as an “Innovative Marketing Company”, “Small Business of the Month”, and “Best of the Bay” in 2014, 2015, and 2016. Together, Ron and Patty have three children, Alexandria, age 20, Thomas, age 14, and Samantha, age 12. Patty Spradling is the beautiful wife of Master Sergeant (retired) Ron Spradling. She is a wonderful mother of three children, Alex (20), Thomas (14), and Samantha (12). She is a graduate of Leadership Pensacola, Class of 2016 and has performed duties as a Pensacola Chamber of Commerce Ambassador for the last 2 years. 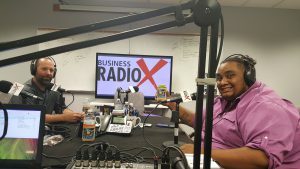 She, along with her husband, currently own a restaurant delivery service called CitySpree of Pensacola that has been recognized as an “Innovative Marketing Company”, “Small Business of the Month”, and “Best of the Bay – Food Delivery” in 2014, 2015, & 2016. Currently heading up QwikMow and leading the Pensacola Elite Network Chapter. Started his first lawn care business at the age of 14. Upon graduation of Woodham High School in Pensacola, Fl he began working with Florida Pest Control. During his almost 7 years there he acquired licensure in several state pesticide categories. Launching into his first full time landscape business venture at 25. He has served as the chairman to the Pensacola State College Curriculum Landscape Horticulture committee, where he advised about current industry issues. In addition to pesticide certification he also has Horticulture and formerly a DEP certification for fertilizer and waterway management. Previously the host of his own garden talk radio show called, The Master’s Gardener. Elden has passion for landscapes and small business. From his second year in business he understood the importance of building relationships. The year he first joined a networking organization he doubled his business revenue. The largest referral he’d ever received from network function led to over $200,000 from one contract over 5 years. The proud president of the original group of The ONE. He looks forward to leading the PEN towards building relationships and each others businesses through permission based referrals. I became pregnant in 2010 and was excited for the next chapter in life to begin. Little did I know what was in store and the impact it would have on my future.My water broke unexpectedly at 21 weeks, and I was admitted to the hospital in pre-term labor. I was on bedrest for 20 days before my daughter was delivered by emergency C-section at 23 weeks and 4 days gestation. She weighed 1lb., 2.7oz at birth and was rushed to the NICU, where she stayed for 120 days before coming home. Our NICU journey inspired me to want to make a difference so that no other family would have to experience the trauma of having a sick baby. I have served as the March of Dimes Community Director since February 2013.It is an honor to serve on the PFAC and to have an impact on our community. Local Business Marketing Consultant. Specializing in Google Plus Optimization, Search Engine Optimization, Reputation Marketing (Reviews) and Google AdwordsPresently own Yolee Solutions. A digital marketing company based out of Pensacola FL. Consulting small to medium sized businesses in optimizing their Digital Real Estate. In addition, president of a Networking Group called THOR – Tuesday Hour of Reciprocity that meet at Cactus Cantina Restaurant on 5121 N 12th Ave Pensacola FL. We focus on building relationships as a way of building trust then referring business to each other therebuy enhancing the end user. Served 10 years as senior IT specialist and consultant to senior management in support of organization wide IT policy, budget and plans for systems development, acquisition, installation, operation and maintenance while planning, organizing, and overseeing the activities of the IT organization and reviewing policies, procedures, mission objectives and organizational design for the staff while serving as the recognized authority in the analysis and direction of IT programs and issues and in researching, interpreting, analyzing and applying operations and security guidance for the commands both as a Commander in the Navy and as a civilian contractor. Former Naval Aviator and Member of 2nd Fleet Air Operation Center Member. Recruiter Serving Former Military Members and finding them Civilian Opportunities with Fortune 500 companies. Specialized in acquiring Companies to Hire our former military members as well as finding eligible military members and entering them into the job force. Betsy Tait has been a lifelong Pensacolian. She has a background in finance and has been a mortgage broker and an insurance agent. She is an entrepreneur that owns several businesses. Betsy is the owner of the Betsy Buys Houses, were she buys pretty houses, ugly houses and pretty ugly houses! She is a member of Saint Luke United Methodist Church, where she has held numerous positions on the church council, the preschool board and the youth Council. Also she’s been involved with the PTA and the PTSA throughout Escambia County. She has been married to her husband, Scott for 34 years. Betsy is also the mother of four daughters, Brittany Kellogg age 28, Jamie Tait age 24, Kelly Tait age 22, and Lieutenant Shannon Tait-Luttrell age 39. Bill Sheffield is celebrating his 20th year in real estate in the Greater Pensacola Market. Bill is graduate of the University of Tennessee and a Marine. During his time in Pensacola he has been an active Rotarian with Sub West Rotary. He is active in the Greater Pensacola Chamber serving as an ambassador for the past 5 years. After working with several networking groups including Pensacola Leaders, Business Netlink and BNI Bill is excited to be president of GROW, an active group of The One. “Working with people to develop relationships always leads to money” As John Maxwell says, “People don’t care about how much you know unless they know how much you care” Bill is the proud husband of Delany Sheffield for 30 years and she is affectionately known as Precious. Angela D’Alessandro has been a very successful Nail Technician & business owner for the past 18 years – current. She has worked at the same salon for over 17 years (Nail Boutique). She decided to start a career in Mary Kay as an Independent Beauty Consultant on April 7, 2014 for extra income, as well as, the relationships and support of such a wonderful and proven company. She also wanted to create a means of giving back to her community.Angela has since become a Team Leader in Mary Kay and is currently striving to become a Director. She has earned many accolades so far. She won the 2014 & 2015 Queen of Sharing within her unit, 2014 & 2015 Top 10 in Sales, & 4 quarter Star with the company.Working 2 jobs, she decided to spend her extra time volunteering for a few organizations that she’s very passionate about. Pace Center For Girls, Impact 100; & added to the list; Take Stock In Children.She decided last November to expand her business by joining a networking group. In the first 2 months of joining she already made back the money she paid in dues & started creating amazing relationships.Angela is currently the President of her chapter PACE (Professional And Community Experts) within The One ( The Organization of Networking Entrepreneurs). She is looking forward to continued growth & building relationships through permission based referrals. She is the very proud mom of two great children and the wife of a wonderfully supportive husband.